As the reader, you got to choose at the end of each chapter what the story did next and then skip to that section of the book to find out what happens based on your choice. It was so much fun getting to participate in the outcome and not just being stuck reading a story without any input. Making choices was thrilling. Part of the excitement as children growing up is that one day we get to start making our own independent decisions. We empower our children by letting them choose one of two options in an effort to help guide them. But then we grow up and many times want to run from the very responsibility. I was talking with a friend the other day who was struggling to make a decision about something important in her life. “I wish I did not have to make a decision for myself. I wish someone else would choose for me,” she said. I have heard that said before by others and I’m pretty sure that I have said that in the past as well. It is becuase at times we feel overwhelmed with the amount of choices and decisions we are faced with throughout our lives. But the power of choice and taking ownership of our path is the most thrilling and critical part of our achievements in life. If life was completely destined and our choices did not matter, life would lose meaning. If we only took a reactive path, our life would feel boring and pointless. Part of what makes us unique is our ability to choose. Part of what helps people survive and not give up is our ability decide who, what, where, when and why. So why would any of us want to give that up? We are emotional creatures and our choices effect other people around us. It feels hard to make a choice that may emotionally hurt another person. It also feels hard to make a decision that could possibly cause ourselves to feel pain. It feels hard when we can’t accurately predict the future or total outcome. 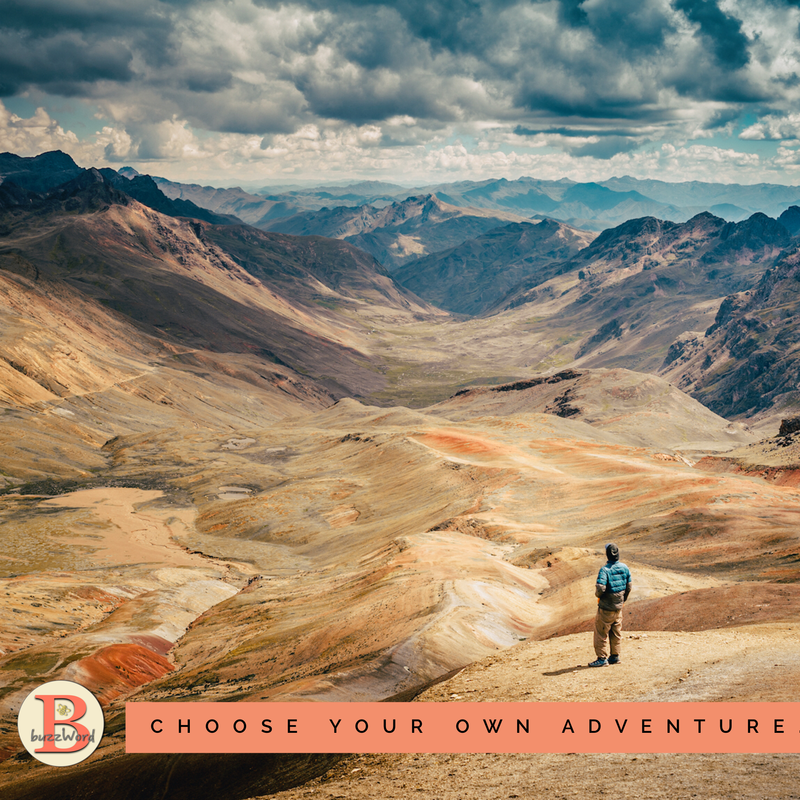 Making our own choices means taking risks and taking an adventure to an unknown destination. If we were to let go of the opportunity to choose and give up that adventure, allowing others to make our decisions for us, then what’s the point? Sometimes it feels easier to wish and hope for a sign of what to do, but they won’t always come. I once prayed for someone to show up at my front door and hand me the manual to my life, telling me exactly how to fix something. But then, would I really be living? Getting the answers handed to you essentially ends the adventure of your life and you would lose your desire to build and thrive over time. Instead, the inevitable default would be that life become a reaction field of victimhood and confusion. By making choices, we claim the drivers seat in the car of our lives. We live empowered and free. So, how can we make this process of making important decisions feel a little less hard? 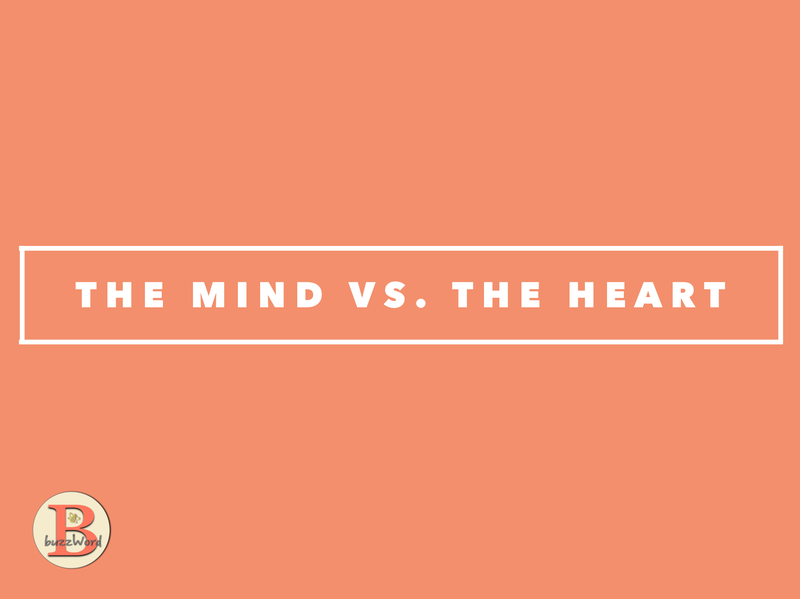 First, try to indicate whether this choice has to be governed by your mind or your heart. After you create your list, evaluate it. What does the list tell you? Does it help you move in one direction over another? Were you honest? Did you write down what you really feel or think you should feel? It might take you a few tries. If you are still struggling after your list, I recommend a personal role-play or daydream, if you will. Play out the situation 2 different ways, not in your head, but out-loud verbally and write it down. What does the cause and effect scenario look like visually? How does it sound? How do others react? How does it make you feel? Do you like it? Where do you end up? Communication is not just an important skill set with others. You communicate with yourself 24/7, consciously and unconsciously. How do you communicate with yourself? Is your tone typically negative and pessimistic? Encouraging and supportive? Worried and stressed? Talking, writing and drawing yourself through various feelings and obstacles can help you get out from feeling stuck and back on the road to making key choices that will get you closer to the life of your dreams. Ah, the fear and worry of regret is often what keeps us in a state of paralysis when needing to make an important choice. 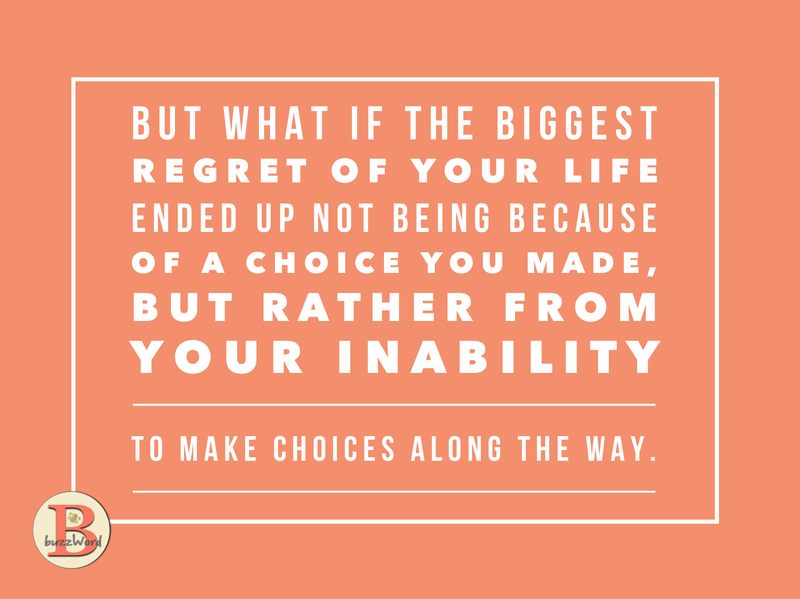 But what if the biggest regret of your life ended up not being because of a choice you made, but rather from your inability to make choices along the way. Letting fear and worry win. Non action, while it could technically can be considered a choice, is really you just sitting idly by, letting the world around you effect your life over and over. Make a choice. Be bold and courageous. Be adventurous. I’m not saying you have to live a wild life. Life can be adventurous and simple at the same time. It just has to be yours. You have to own it. You GET to own it though a series of choices. You get to be the star in the story of you. 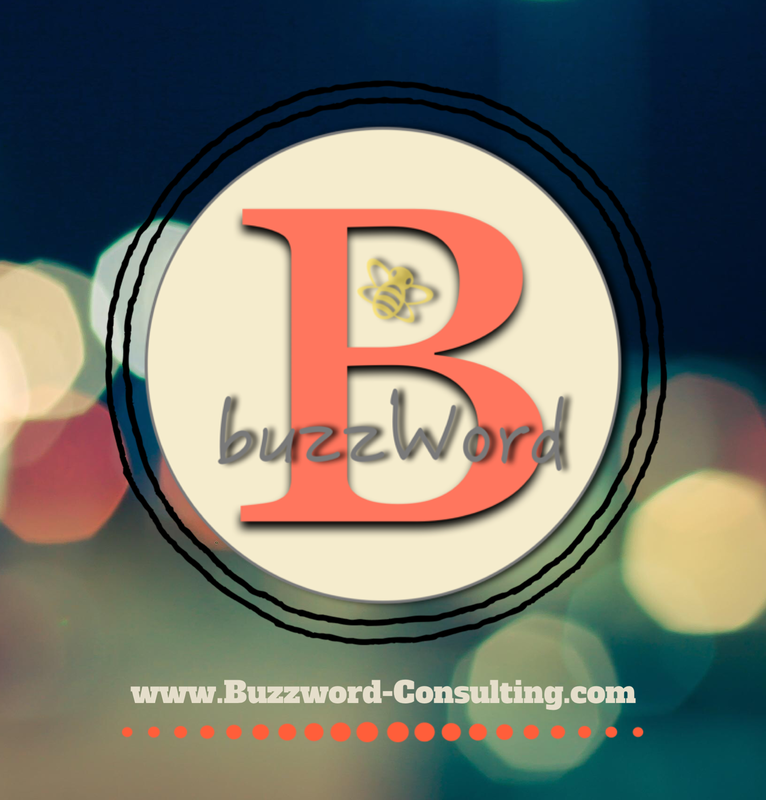 Join Buzzword on Facebook and Twitter! Good advice and insight. That books sounds great – I like to skip ahead in all books anyway so that would have been perfect for me, too! I have a family member who struggles with decision making and I have tried to help – I will save and share this handy guide! Thank you!